Michael D’Antuono’s work is striking. His background as an illustrator sets a foundation for a remarkable oil painting style – deep shadows all set among poignant messages. After years of being instructed what to draw, the contraction of severe tendonitis led him to lay down the pencils and pick up oil painting – a move he says does not pay as well, but is much more rewarding. But, really, it’s all best explained in his own words. Lucky for you, I caught him for a quick interview via the internet! Art Threat: Looking through your bio, you took up oil painting after suffering severe tendinitis and having to stop your illustration career – what was the inspiration behind your first pieces, particularly “The Truth”? Michael D’Antuono: After25 years of being dictated what subject matter to render as an illustrator, the sudden freedom of limitless choices of what to paint as a fine artist was somewhat daunting. It was somewhat like asking a recently emancipated slave what he wants to do for a living or asking a kid to decide between 28 flavors of ice cream. Having cable news on in the background day after day while trying to decide on subject matter, I noticed that whatever the issue or event going on at that time, the contrasting reports of it seemed to contradict one another. While MSNBC would report on the newly elected president with almost divine devotion, Fox’s report would covertly paint Obama as the anti-Christ. That kind of reporting was creating a divisive environment void of any objectivity. That’s why I titled my painting of President Obama with arms stretched wide in front of the presidential seal, holding back a black veil and wearing a crown of thorns, ‘The Truth’. Its varied and contrasting interpretations was bound to show how distorted our views are by our political prejudices. The four thousand emails and articles I read from different countries concerning the piece proved me right. Ironically, the respective news media used the painting itself to once again, to further their own agendas. You say that you regret the decision to take The Truth down from its place in New York’s Union Square Park – you later painted “…what I meant was…”. How was the reaction to this second painting different than to the first? Were you satisfied with the second result more than the first? I regret the decision because I feel I have a right to show my art and no one group has the right to censor me. Since my intention was not to offend anyone’s religious beliefs, but to question our own subjectivity, I was unprepared for the overwhelming negative reaction to the piece. I cancelled the showing not so much because of the violent threats, but by the profoundly desperate pleas of thousands of distraught Christians, who were so overcome by their misinterpretation of the painting. For those who missed the inference in ‘The Truth’ that Obama was only metaphorically being crucified by the right, I painted ‘… what I meant was…’ It has the same basic message without the religious symbolism. Without the religious aspects to draw ire, the painting went virtually unnoticed. There was nothing for the media to use to incite their base audiences. Lack of coverage could also be attributed to the media’s reluctance to promote a piece that calls attention to their own bias. Your work is very much about capitalism’s influence over politics – some in a way are quite literal, such as “Small Government” and “American Pie”. Can you speak to the creation of these images? I’m not against capitalism. I’m against Corpocracy. What we have now is a government doing the bidding of the corporate elite to rig the system in their favor at the detriment of the rest of us. ‘Small Government’ points out the corporate elite’s “joy” of having a government small enough to fit in their pocket. They want a small government like other criminals want a small police force. ‘American Pie’ depicts how Wall Street fat cats have ironically been richly rewarded for their bad behavior. The piece lampoons the theory that trillions in bailouts and tax breaks to the rich will somehow miraculously trickle down, raining prosperity on all. Murder by Media and Unbalanced are two of my favorites, what is the back-story for these two images? The shooting of former Democratic congresswoman Gabby Giffords and the murder of Dr. Tiller are examples of the power of all the fear and hate mongering perpetrated by the conservative media have incited certain “unbalanced” individuals to violence. While both ‘Murder by Media’ and ‘Unbalanced’ predate those violent events, the potential dangers of the constant barrage of such reporting had inspired me to paint them. Less dramatic, but just as dangerous is how their lies and distortion has successfully persuaded about half the country to vote against their own best interests. I often like to add some subtleties to my paintings to enjoy after the initial shock has worn off. Few people notice the reflected word in the pool of blood in ‘Murder By Media’. How has oil painting been different for you than your previous time illustrating and working in advertising? While I employ skills from both careers, my fine art affords me the opportunity to communicate the messages I believe in. My former careers paid better but this is much more rewarding. What current issues are on your mind that you are starting to address in your work? While my work in general exposes hypocrisy, corruption and social injustice in wherever I see it, right now I’m focused corporate control of government. The tail is wagging the dog, and no smart dog will bite the hand that feeds him. I believe taking the monopoly of power away from the 1% with 100% publicly financed campaigns, and our government will work equally for all. What upcoming projects or shows do you have? I have just completed a trilogy of paintings titled ‘Portraits of Redistribution’. 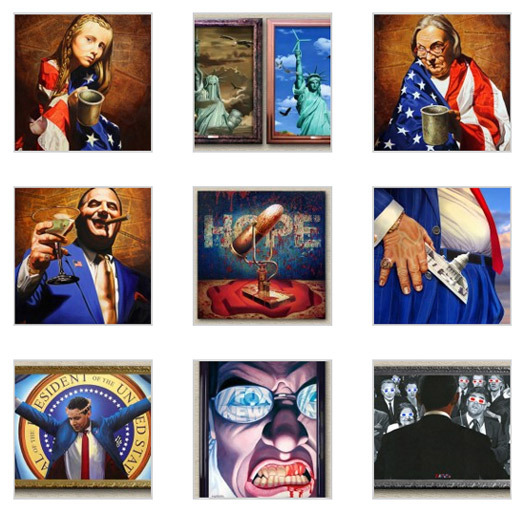 The paintings illuminate the government’s questionable distribution of “shared sacrifice” by featuring a child, a senior, and a Wall Street fat cat respectively, positioned in front of torn headlines that reflect how they fared from the economic collapse. I’m currently putting a short video together along similar themes of corporate control, class warfare and opportunity inequality that I hope will get some play and make an impact.